Back in the late 60s / early 70s, Marvel licensed their characters for a series of Black Light posters. These vibrant posters sprang to life when illuminated in the glow of black light bulbs. Many characters received the treatment, but the one hero who was featured on more posters than anyone else was Doctor Strange! The best poster IMHO was the one above, featuring Doc facing off with Eternity. Dr Strange is in his masked superhero costume, which I loved more than many of you. This costume, the swirling madness of Eternity, and the color scheme make this image a perfect choice for a black light poster. You have to place yourself back in that context: sitting in a Berkeley apartment, taking a little hit of whatever to expand your cosmic consciousness, playing Pink Floyd and looking at Doc under the light. None of which I did, btw, but that was the target audience of these posters! The above and below posters were taken from splash pages inside Doctor Strange 180 (1969) with artwork by Gene Colan and Tom Palmer. There is something interesting about this particular cover. I wanted to confirm that Gene Colan drew the cover--I was pretty sure that he did as Doc looks to be in a typical Colan pose. However, Marvel Wikia states that the cover is collaboration between Colan and Steve Ditko! The figure of Eternity must have been lifted from an earlier Ditko drawn comic and pasted in here. The opening splash page was also made into a poster. As someone else said, this looks like it was taken from a rather bad copy. It should have been really groovy but it looks murky. This landscape panel of Doc entering a typical Ditko landscape was also a poster. Who was the artist? Not Ditko or Colan, that is obvious if you are a Marvel fan. My best guess was Dan Adkins, who drew the series in the 1960s before Colan came on board. The real answer is that this is from Doctor Strange #171 (1968), a rarity in that Tom Palmer (most famously known as a superb inker/colorist for most of his career) actually penciled this issue, with Dan Adkins embellishing! Pretty cool scene and worth of a poster, they must have chosen this one because it was a double page spread. 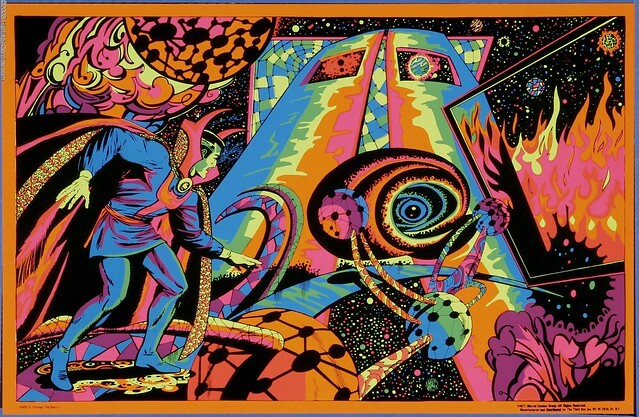 You have to wonder what a Steve Ditko splash page would have looked like as a black light poster. If you want to see more Marvel black light posters, please visit artist Nick Derington's page on Flickr where he has a lot of them. Nuff Said!